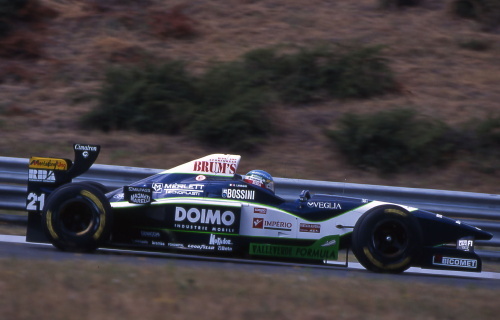 Minardi's 1996 entry was a distinctive green, white and black car, which looked pretty much the same as the one the team had raced with in the previous year. Equally, the car was little improved from the 1995 season, aptly named the M195B. Money was tight and the team failed to produce any result of note that year. Pedro Lamy managed to stay on for another year, and even though Minardi had no money to waste, young Italian driver Giancarlo Fisichella was given the chance to make his debut at the top level of motorsport. Impressing by outqualifying Lamy at his debut race in Australia, Fisichella was sidelined for two races to allow Brazilian Tarso Marques to please South American sponsors at the events in Brazil and Argentina. Fisichella returned for the European races and gave Minardi its best result of the season, eighth in Canada. While such a performance would have been sufficient for points nowadays, only the top-six made it onto the scoreboard until 2003. Fisichella was again asked to vacate the cockpit for the final six event of the season, making room for fellow-Italian Giovanni Lavaggi who brought along some personal sponsors. Coming to the team at a late stage in the season, Lavaggi was outpaced by Lamy in qualifying and failed to make the grid twice.